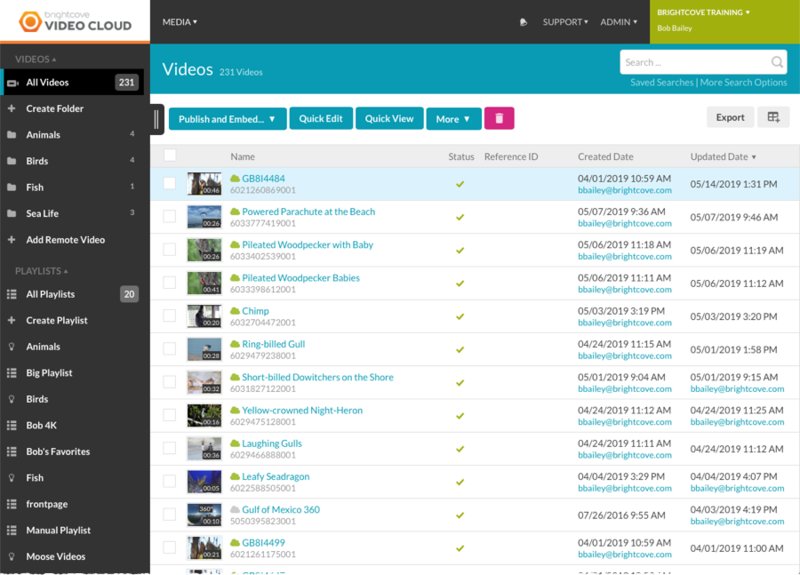 To access the Media module, login to Video Cloud Studio and click Media in the navigation header. The video thumbnail will indicate whether a video is shared into the account, or shared out to another account. In the example below, the Brown Pelican video is shared out to another account and the Horses Leaving the Paddock video was shared into this account. Video thumbnails also indicate videos that are marked as 360 degree videos by adding a 360 badge. For more information on working with 360 degree videos, see Working with 360-Degree Videos. Multiple videos can be selected by clicking on a checkbox and then shift-clicking on another checkbox. The list of videos can be sorted by clicking on a column header. The Media module uses a "sticky" sort and will remember the sort selection. When you navigate away and come back or login again, the Media module will default to the sort that was last selected. The user ID of the user who created and/or updated the video will be displayed in the Created Date/Updated Date columns. If the action was taken via the CMS API, the user id will be the email address of the user who create the client credentials used for the API request. Note that if a user who performed an action is removed from an account, their ID will still appear. This feature was enabled on December 7, 2018. Any videos uploaded or edited after this date will display user information. 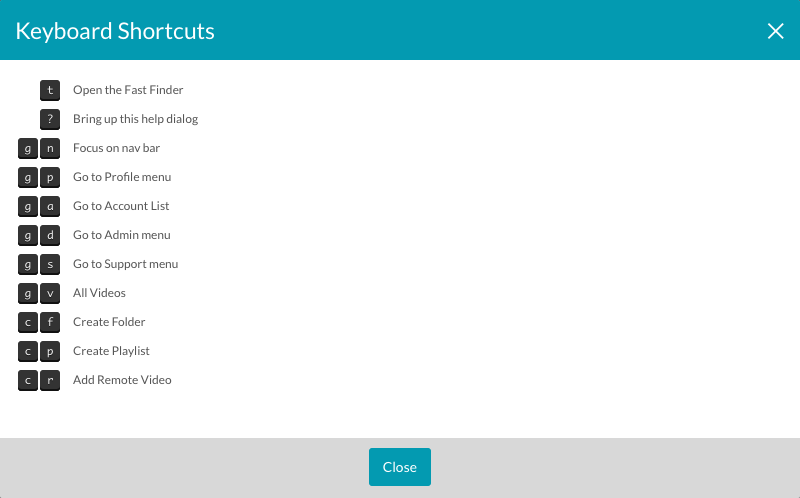 The side navigation panel displays video, folder and playlist information. Remote videos can also be added. The side navigation panel is displayed by default. The side navigation button can be used to hide and show the side navigation panel. The size of the side navigation panel can be changed by clicking on the black border and dragging. To edit the video properties, click on the video name to open the video properties page. See Editing Video Properties with the Media Module for information on editing video properties using the Media module. To edit video properties for multiple videos at the same time, use the Quick Edit feature. To delete videos, click the checkboxes next to the video thumbnails of the videos to delete and then click Delete. Confirm the delete by clicking the Delete button. If the video has been added to any manual playlists, that will be indicated. To see which manual playlists the videos is in, click the video title to open the video properties. The Video Information properties will display the manual playlists that the video has been added to. Videos can be added to folders to help organize content. For more information on working with folders, see Organizing Videos Using Folders. With remote videos, you maintain your video files on your own or a third-party system and then provide Video Cloud with the URL of the video files. For more information on adding remote videos, see Working with Remote Asset Videos. Playlists can be created to group related video content. For more information on working with playlists, see Creating and Managing Playlists. Media sharing allows publishers to upload videos once and then share the videos to other accounts. The accounts can be your own, corporate accounts or accounts of other publishers. For more information on sharing videos to other accounts, see Media Sharing using the Media Module. The Media module provides the ability to export video metadata for all of your videos or a subset of videos to a .csv file. For more information, see Exporting Video Data. The Quick View panel can be used to quickly view video properties. To open and close the Quick View panel, click Quick View. The panel will display a subset of the video properties for the selected video. Note that the Quick View panel is read-only. If multiple videos are selected, Quick View will display the properties for the last video selected. The Search field can be used to search the videos and playlists in your account. For more information, see How to Search for Videos and Playlists in the Media Module. The columns that appear in the body of the page can be customized by clicking on the Columns button and then selecting the columns that should be displayed. Note that the list of columns will also include any custom fields that have been created for the account. As more columns are selected, it is possible to horizontally scroll to see all of the columns. Pressing the ? key in the Media module will open a list of the shortcut keys that are available.